It is surely surprising that someone should get as far as seriously following the process of Krishna consciousness, only to give it up again. Most of us experienced an immediate relief of suffering when we joined, and we have all heard many times how pure devotional service to Krishna is the highest platform of happiness. Throughout Srila Prabhupada’s books it is made clear that the root cause of misery is turning away from Krishna, and still devotees turn away from the process and plunge themselves back into the material whirlpool. And it is by no means an unusual phenomenon, as those of us who have been around a while will testify. I don’t believe any actual figures have been kept, but I would suggest that probably the greater number who commence the process, chanting sixteen rounds and following the principles, will slacken or stop their practises at a later date. They may not argue that the process does not work, but the fact they have ceased practising speaks for itself. Perhaps they are now absorbed in a material career, or have taken up some other spiritual path, or ‘new age’ doctrine, or whatever. All of these are sought because they are seen as a means to happiness, to solving the problem of suffering. And if they are pursued to the exclusion of sadhana then obviously they are viewed as a better solution, at least for the time being. It seems then that the point of Krishna consciousness, that it destroys all misery and bestows the highest happiness, is somehow being missed. Srila Prabhupada certainly saw Krishna consciousness as the solution to all problems, personal and social, immediate and long term. In 1974 he even asked devotees to write a book called “How Krishna Consciousness Can Solve All The Problems of Life.” At this time he asked his disciples to present a new problem to him each day and he would explain how Krishna consciousness is the answer. This eventually led to the “Spiritual Solutions to Material Problems” section of the Science of Self Realisation. Scripture makes it clear that Krishna consciousness is the sure remedy to suffering. In its very beginning Srimad Bhagavatam states that it “uproots the threefold miseries” and Srila Prabhupada comments, “…by service (to the Lord) one is immediately freed from material encumbrances.” (1) As is often the case with such instructions, Prabhupada uses the word “immediately”. In other words our problems begin when we identify with matter. Thinking ourselves to be the body, we experience the miseries that afflict it, such as old age, disease and death. This misidentification is the fundamental anartha, or unwanted contamination of the heart. It leads to the subsidiary anarthas of lust, greed, anger etc, as we try fervently to achieve bodily or mental satisfaction. These various impetuses drive us to all kinds of foolishness, along with their resultant painful reactions. Hence uprooting our suffering means destroying the basic misidentification with matter. This is made clear in the Bhagavatam. “The material miseries of the living entity, which are superfluous to him, can be directly mitigated by the linking process of devotional service.”(4) “Linking process” means connecting with Krishna, seeing our true identity as his eternal loving servants. Again we should note in such references that terms like “at once” are used. The relief from suffering is immediate. So how can we get that immediate relief? Many devotees, as mentioned above, have had some taste of it, but still went away. It seems they were not experiencing sufficient alleviation of their pain to maintain diligent spiritual practises. They thus turned to other solutions that they felt were more immediate, putting aside the actual means of eradicating their suffering condition. What I would like to consider here is the possibility that they did not fully experience the benefits of Krishna consciousness because they did not fully practise the process as given by Prabhupada. I feel that a key element may have been missing, that of effective hearing and chanting of Krishna katha, specifically Prabhupada’s books. Hearing is the first of the nine angas, or limbs, of bhakti, and it is the primary limb upon which all the others depend. In the purport quoted above Prabhupada describes this as a “primary practise” of bhakti that will cause the creeper of love of God to grow all the way to Krishna’s lotus feet. It is my belief that in general we have failed to appreciate the critical importance of hearing and discussing Krishna katha together. As a result we may not have deeply assimilated the messages of Krishna consciousness and thereby felt the benefit. We may have been attending the morning programme, including class and chanting our rounds, but still felt that something was missing, and thus even after some years of practice we are still not feeling the full effect. Another problem associated with a failure to deeply analyse our books is that we may fail to understand our duty. The result of not properly following sastra is explained by Krishna in the Gita. “He who discards scriptural injunctions and acts according to his own whims attains neither perfection, nor happiness, nor the supreme destination. ”(9). Even though we may not deliberately “discard” scriptural instruction, by not properly understanding and practising the philosophy we effectively do this, and thus experience the above unwanted outcomes. Sadhu-sanga, or sat-sanga as it is also called, is the second element of devotional practise after sraddha or faith, as defined by Rupa Goswami. We could go through Srila Prabhupada’s books and extract any number of quotes emphasising the importance of associating with devotees. So what exactly constitutes sat-sanga, and who is the ‘sat’ or sadhu referred to in sastra? Prabhupada would often cite a key Bhagavatam verse that describes how by sat-sanga, by discussing Krishna consciousness in the association of devotees, the whole process of bhakti unfolds. This verse appears three times in the Chaitanya Charitamrita, twice cited by Lord Chaitanya himself in his instructions to Sanatana Goswami. Generally Prabhupada says that we must hear and chant in the association of pure devotees. Indeed, as quoted above, such association is the ‘root cause’ of bhakti. In one place Srila Prabhupada defined sadhu sanga as “associating with the bona-fide spiritual master and abiding by his order.”(28) In the Bhagavatam verse about sat-sanga, cited above (3.25.25), Prabhupada translates the word ‘satam’ as “pure devotees”, and this is usually how he translates the word ‘sadhu’. There is no shortage of such statements throughout Prabhupada’s instructions. We need the pure devotee’s association. The question then, is what does ‘pure devotee’ mean? There are many statements by Prabhupada describing their symptoms, but this can be a somewhat subjective area. One man’s pure devotee may well be another’s rascal. Where one person sees all the qualities of a pure devotee as given in sastra, another may have quite a different view. However, although there may well be other pure devotees, there cannot be any argument that Prabhupada is the “right person” as described here. He has made his association freely available in his instructions, which are intended for everyone in our society. Those of us who are not his initiated disciples need to find someone from whom we can receive instruction and initiation, but we can also derive immense benefit by hearing directly from Srila Prabhupada through his books, especially in the association of devotees. Perhaps that association will be primarily our own spiritual master, as Prabhupada suggests above, but even if this is not possible we can still come together to discuss Krishna consciousness on the basis of Prabhupada’s teachings. In that way we will get the association of a topmost sadhu, the maha-bhagavata devotee, Srila Prabhupada. It is my belief that by deeply and carefully studying and discussing Prabhupada’s books we effectively get the association of both Bhagavatas , the book and the person. As Prabhupada so painstakingly produced his books, it surely behoves us to also try painstakingly to understand what he wrote. And by so doing all the benefits listed above will be ours. As I have shown above, this destruction of anarthas or unwanted things in the heart is the effect of proper sat-sanga. If we are actually associating with Prabhupada, through his instructions, this should be happening. However, in my experience so many of our classes fail to offer Prabhupada’s association. 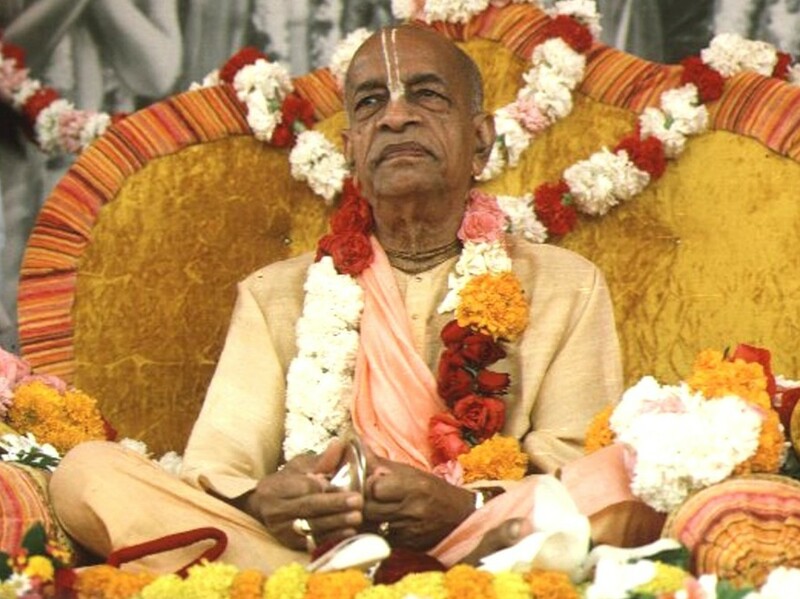 Often the speaker will read the verse and purport, and then deliver his or her own thoughts on the subject with scant reference to Prabhupada’s actual words. Stories, jokes, anecdotes, pep talks, favourite cause espousals, outright speculation and even mundane discussion of politics or whatever, are all too common in classes I have heard (and I have recently made a fairly wide study of them). Even where the speaker sticks to the philosophy, it is still rare to hear a class that adheres closely to Prabhupada’s words, seeking to deeply unpack and understand his meaning, and then discussing that together. We are thus mostly getting the speaker’s association, rather than that of Srila Prabhupada, the undoubted sadhu. Some of us may be pure devotees, but speaking for myself I am still a conditioned soul, and I would venture to suggest that many of us called to give class are in the same floundering boat. We are aspiring pure devotees, on the path of sadhana bhakti, which means still becoming freed of anarthas. As conditioned souls we must therefore stick very closely to Prabhupada’s words in order to not speak ‘anything from our own side’, as he puts it. Siksa means instruction, and thus to ensure that Srila Prabhupada is the “prominent siksa guru” in our lives must mean prominently hearing from him, and that surely begins with class. And Prabhupada wanted class to be a learning experience. “We should have regular classes, just like school and colleges, eight hour, six hour. Be engaged always in reading Srimad-Bhagavatam, discussing amongst yourself. Then you’ll make progress. Otherwise, if you take it as an official routine work… You should take as routine work, but with consciousness that “We have to learn something,” not simply attending the class, but to learn something. In this way make your life successful.” (40). Note how he even suggests that there be six or eight hours of classes a day, although mostly he would instruct that there be one hour of class in both the morning and evening. Even this is often minimised, with morning class as short as thirty minutes (after all the preliminaries), and evening class non-existent for most. Many devotees do not even attend the morning class. Of course, where temple attendance is not possible we can conduct our classes at home, but the main principle I would stress, wherever we hold class, is the need to hear the words of Srila Prabhupada. To conclude then, I believe that if we institute more direct hearing from Srila Prabhupada, especially in classes, we will see a fall in our attrition rate. Devotees will better experience the benefits described above and be less inclined to seek other, paltry solutions. Krishna consciousness will be seen as the all-encompassing remedy for every problem, and we will quickly feel the wonderful effects of Prabhupada’s powerful association.